Corner café-bar that premiered during Berlin's 2014 Easter leather weekend but opened officially a month and a half later on 1 June 2014. 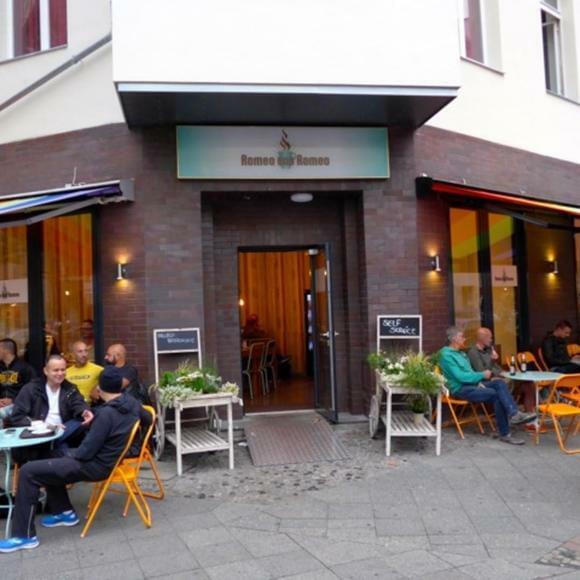 Operated by the people behind Tom's Hotel, Romeo und Romeo introduces a sleeker and less glossy look to the Motzstraße, certain to emerge as a Schöneberg gay hot spot, from breakfast to midnight (at weekends), with home-made Viennoiserie, cakes, baguette-based sandwiches and booze a draw, not to mention its prime catwalk location, formerly Musikbar Eldorado but most famously, in the 1920s and early 30s, cabaret nightclub Eldorado. Popped in here for a coffee and sandwich. Staff are very friendly ( and hot!!) sandwich was tasty, coffee good and place was clean and bright. Locals seemed a friendly bunch too. Definitely worth a visit for a snack and relax time. Thanks for a very pleasant stay .